The 3D platformer is a staple in mobile games for good reasons; it is easy to get into and loads of fun. Of course, the developers need to serve up new and interesting concepts to keep gamers interested. Digital Melody did just that with Runventure, an adventure spanning the world where you battle monsters and unearth secrets. The most distinguishing feature of Runventure is its control scheme. Instead of autorun, you use a slider to direct your character right or left. To run faster you just slide further and as you do so, indicators appear which tell you how high you can jump. Lift your finger and he jumps. The controls are unusual, but it only takes a few tries to get used to it. And because this is not an auto-runner you can adjust your movement and avoid jumping too early or too late. Of course, a platformer needs collectible coins and Runventure is no exception. Grab as many of these coins as you can especially the pink ones as they are the most valuable. The gameplay itself is different from the usual endless runner. The characters have specific missions to accomplish, so this is not just about getting to point A to point B. These missions get more challenging and you will face a wide range of enemies. Being able to change heroes is an advantage though and one you be happy to use. 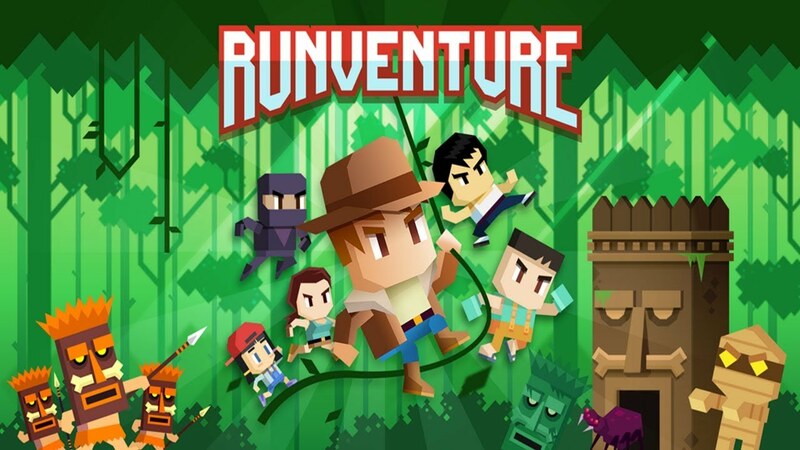 Runventure contains familiar tropes, but it feels new, as the controls, the layout, and the presentation makes it an exciting game.